This spacious apartment in the 1st floor with separate entrance consists of a large combined kitchen/living room with TV, card telephone and free Internet. Two bed rooms with Air Conditioning and two single beds each (possible to brush together). Showerroom with toilet. Washing machine. Large, equipped roof terrace with table, chairs, sun-chairs and sunshade. From here you have nice views to the harbour and Marsaxlokk Bay. Clean, spacious apartment (approx. 70m²) at very nice and hospility owners, who live just aside. We are a pure family business since 20 years now. We mediate holiday properties in Malta and on the neighbour island Gozo. A small "jubilee"! Whereupon our first contacts to this beautiful island and our friends there, are much more longer. For all questions to your planned holidays, we are pleased to advise and help you with our longtime experience. All accommodations are personally inspected. We yearly meet the owners and landlords in Malta. During all meetings, we are anxious for increasing the standards. A faithful and personal contact with you, as with our partners, is very important for us. Besides all, we are in close contact with Malta Tourism Authority. Bit dated but well equiped and comfortable. Great location lovely to be a short stroll from the quayside up a quite road. Easy transport links via regular bus services. Useful little spar shop and local corner shop not far away for basics. Plenty of space in the appartment which was well equiped and beds comfy. Only real negative was the temperature, there is no real heating which for a December trip was a bit tricky. couldn't get the air conditioning to blow hot in the bedrooms and the lounge took a while to warm up in the evenings with one plug in oil filled radiator, bit tricky as we were out and about for long days so the lounge was warm as were going to bed. Was great to have the roof terrace to get towels etc dry. Friendly and welcoming host who even offered to drive us to a supermarket! All in all a good spot would recommend. I'm very happy to hear, that you liked your holidays at this apartment. The owners are very nice and hospitable indeed! I'm sure that Frans had provided another heater for the kitchen- and living area, if you felt cold. Beside this, the period you stayed, was sometimes colder than the average over years. Very pleasant apartment and nice owners. The apartment was very well looked after, clean, comfortable with all you needed, if anything was needed then the owners who live next door were always at hand and more than pleased to help. We posibly had a different reason for enjoying the holiday as we were visiting relatives who also live in Marsaxlokk but all in all great time and good accomodation in a good position. Lovely location in a quiet road just minutes from the harbour with a lovely helpful owner next door. The property could do with a bit of an update but is perfectly adequate for a holiday. Marsaxlokk isn't a large place so no supermarkets yet but there are local shops nearby, good food at the restaurants along the harbour and there's a bus stop just round the corner if you want to go and see more of the sights of Malta. I really enjoyed staying in Ta Diegu. It was a quiet location, just minutes from the harbour and the bus stop. Frans and Doris were the perfect landlords and being next door they were able to help with any queries. The apartment itself is not high in interior design but is roomy, airy and very clean and there was plenty of towels and sheets. I was travelling on my own and I felt very safe and secure in it. The roof terrace offered plenty of space for alfresco dining and sunbathing. Marsaxlokk has a good selection of restaurants at the harbour front and all the meals that I ate there were delicious and good value. They are very busy at lunchtime but not all the restaurants are open in the evening which makes Marsaxlokk a quiet and peaceful holiday destination. I visit the islands very regularly and will certainly be back to stay at Ta Diegu. The apartment was basic but very comfortable and in a great location. The hosts Frans and Dorian are lovely people and very hospitable. There is a bakery almost opposite, fresh fruit and veg shop and grocery shop just round the corner and the best ever fish shop a short walk away. The buses cheap with bus stop 1 minute walk from the apartment and the sea front with all the restaurants at the bottom of the road, . Some of the restaurants not brilliant (be discerning and check prices when you order) some owners just dish out the food (not always good food) and take your money, but there are some great places to eat, just look for where the locals are. Marsaxlokk in the south of the island, is the oldest and most beautiful fishing village. 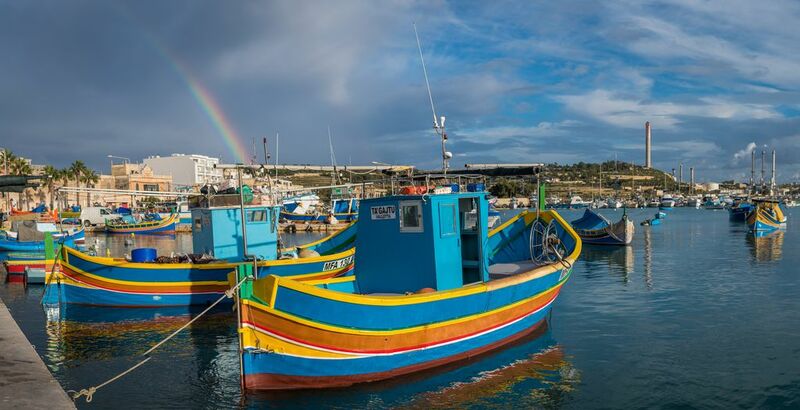 The colourful, typical Maltese fishing boats in the harbor, named 'Luzzi', are very pitoresque. You don't find any hotels, but several nice restaurants just at the sea promenade and possibilities for shopping. The original baker is just nearby. Sundays is a big market at the harbour. Harbour, Restaurants, Shopping and bus terminus are all within a radius of 200m. There is the possibility that the owner takes you with his 'Luzzu' for fishing to the sea, for low costs. May be you catch your dinner for yourself? Preise zzgl. Stromkosten € 0,25/Kwh (lt.Zähler), ansonsten inkl. aller Nebenkosten. Auf Wunsch Heizofen (Gas) nach Verbrauch. Besonderer Service: kostenlose Lebensmittel-Erstausstattung zur Ankunft. Kinderbett € 25,- pro Aufenthalt. Kinderhochstuhl kostenlos. Wöchentlicher Wechsel der Bettwäsche und Handtücher. Prices for 1-4 persons including all extras - except electricity € 0,25 per Kwh. Weekly change of linen and towels. Free Wifi. Cot € 25,- per stay. High chair free of charge.